Help ADI save Peru’s circus animals. Peru banned the use of wild animals in circuses over two years ago, now the Peruvian Government wants to work with us on enforcement – just as we did in Bolivia. We cannot save these animals without your help. 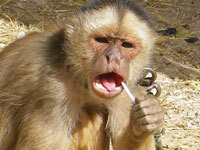 Right now animals in Peru are still in their disgusting circus cages – with your help we can save them. President Alan Garcia outlawed the use of wild animals in circuses in this Latin American nation of 30 million in July 2011. The ban was secured following our shocking investigation of circus suffering. 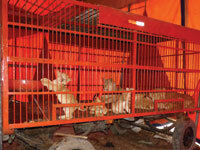 ADI exposed lions being whipped and beaten, monkeys, bears and other animals kept in appalling conditions. This launched an intensive four-year campaign by ADI Latin America and supporters, which succeeded with the new law. For the Bolivia rescue, ADI and wildlife officials raided eight illegal animal circuses. We saved every animal; the story is told in the film Lion Ark. This successful operation encouraged other countries to follow Bolivia’s example. Now we must help ensure those bans become a reality. Peru is larger than California and Texas combined, with 24 regional governments, which all need to enforce the ban. In an encouraging step towards implementation, Peru’s Ministry of Agriculture recently issued an edict preventing circuses with wild animal acts from entering and traveling within the country. Minister Milton Von Hesse La Serna issued a 30-day limit for compliance and said that technical assistance will be provided to regional authorities to facilitate implementation. But the ministry has scarce resources; it cannot provide people to travel to each circus and log the number and species of animals that need to be rescued. That’s why we must get our ADI rescue teams on the ground. For the past few months, ADI has been tracking down the circuses and documenting violations of the law; our teams have been attacked by the circuses, and one person was hospitalized with a broken leg. However, we must not be intimidated and must increase our teams logging the numbers and species of animals to be rescued. ADI urgently needs funds to ensure that the ban is enforced and to undertake the rescue and relocation of the animals. Enforcement of the ban and rescue of animals will take huge resources. Help us end circus suffering in Peru. Thank you.